Never cap your crape myrtle trees. Above – the wrong way. Below – leave them as trees. The best time to prune is late winter, February – March. The goal is to enhance the trees natural form, don’t force it to grow in a small space or prune it into an artificial shape. Crape myrtles naturally grow as small upright or vase shaped trees with multiple trunks. A well pruned crape myrtle will have the trunks grow upward and outward, with branches fanning out rather than growing inward into the center of the tree. 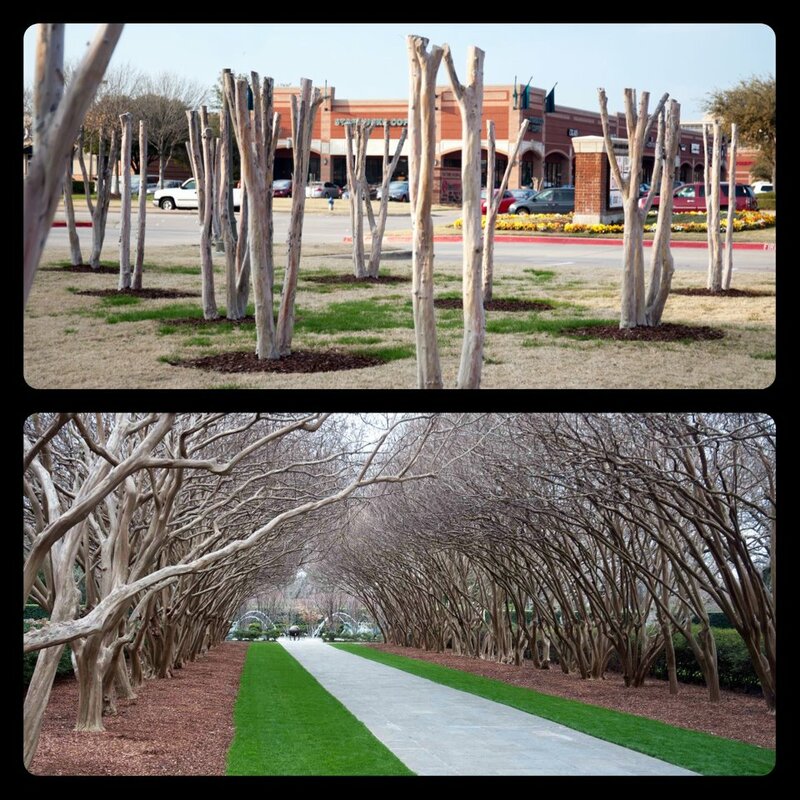 To determine if your crape myrtle needs to be pruned, examine the direction in which the trunks and branches grow. Starting at ground level, follow the trunks upward to where they begin to branch, focusing on the interior of the tree rather than the outer edges. Branches that grow into the center of the tree, crossing over other branches or trunks, should be removed. To remove a branch, follow it back to where it joins a larger branch or trunk. Take a close look at the point where the branch joins the trunk. You will notice at the point where the two join the branch is swollen or enlarged. This area is known as the branch collar. Using a pruning saw, remove the branch by cutting just above the branch collar rather than flush with the trunk. If the branch was removed at the correct place the branch collar left behind will extend out a centimeter or two from the trunk. The wrong way to prune. A misconception that crape myrtles need to be severely cut back in late winter or early spring in order to flower well in summer has led to the unhealthy practice of topping these plants. If necessary, crape myrtles can be reduced in height without being topped. Topping (buck horning or de-horning) or “crape murder” involves cutting stems back at an arbitrarily chosen height rather than pruning back to a bud, side branch, or main stem. Topping trees and shrubs is harmful in many ways and regarded as an unacceptable practice by trained horticulturists and arborists. Research shows that stem decay significantly increases when topping cuts are made, and that more dead branches also occur within the canopy. The trees are more prone to disease as well with topping. This entry was posted on Sunday, January 31st, 2016 at 8:38 am	and is filed under Garden, News & Updates. You can follow any responses to this entry through the RSS 2.0 feed. Both comments and pings are currently closed.